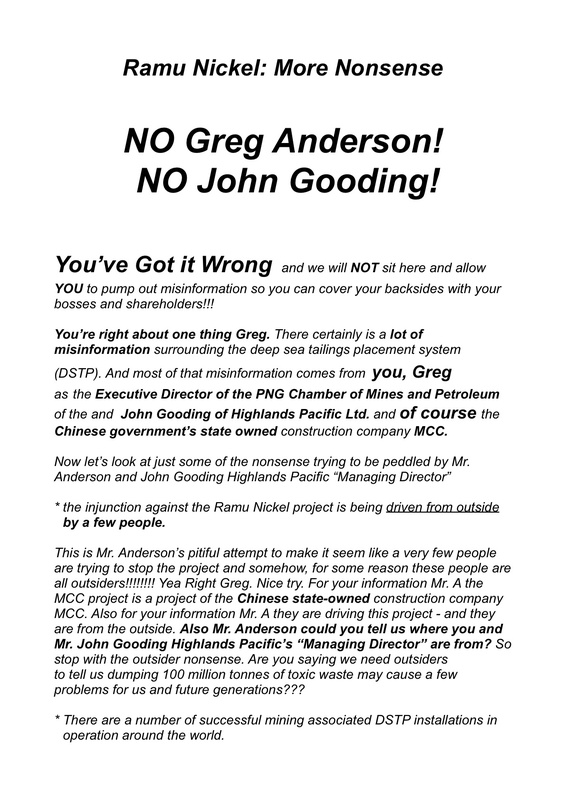 Landowners affected by the Chinese State owned Ramu nickel mine have hit back at criticism of them by Greg Andreson of the PNG Chamber of Mines and John Gooding of Highland’s Pacific with a full page advertisement in PNG’s daily newspaper. More than 4,000 indigenous landowners who could see their land and fishing grounds polluted by mine waste from the Chinese State owned Ramu nickel mine have signed a petition against the waste dumping plans. Madang Governor Sir Arnold Amet has been invited to Bongu village to receive the petition from the people. On April 14, landowners from many of the Rai coast villages, as well as from the North Coast, Madang town and Karkar Island, gathered at Bongu village to share their experiences and concerns about the deep sea tailings placement system, which would see five million tonnes of tailings from the mine dumped into the Basamuk Bay every year – 100 million tonnes over 20 years. During the day, hundreds of people lined up to sign the petition, which calls on Sir Arnold to stop the STD system, and force the mine developers China Metallurgical Company (MCC) to find an alternate system of disposing of the tailings. 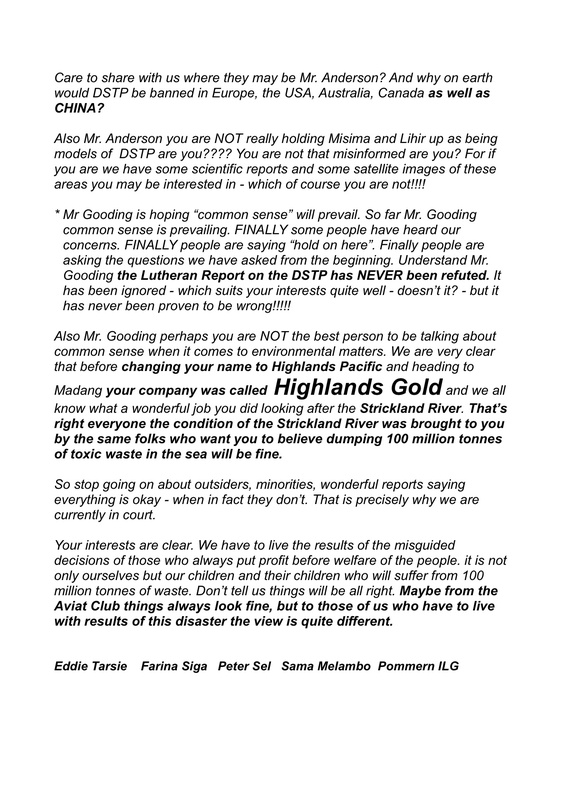 Mr Tarsie disputes claims by Greg Anderson from the PNG Chamber of Mines and Petroleum that people were being misinformed about the dangers of the mine, and insists that the only misinformation is coming from the company and the Government, when they say that the STD is safe. The Mineral Resources Authority, a PNG government agency created in 2005, has engaged one of the regions largest law firms, Allens Arthur Robinson, to defeat a case brought by a group of indigenous landowners worried by the potential environmental impacts of the new Ramu nickel mine. Allens Arthur Robinson employs more than 1,500 lawyers in 14 offices across Australia and the Asia region and boasts that 45 out of the world’s largest 100 companies are clients. In contrast, indigenous landowners in PNG are some of the poorest in the world with 60% living below the international poverty line and PNG ranking a lowly 148th out of 180 countries on the United Nations Human Development Index. For example indigenous people in PNG suffer from maternal mortality rates which are some of the highest in the world at 773 deaths per 100,000 live births and more than 500 people die unnecessarily every year from maleria. The MRA says that its vision is “to improve the lifes of Papua New Guinean’s through responsible managment of the nations mineral resources” and its goals include “encouraging the participation of local people” and “ensuring optimal benefits for the people”. If this vision and goal are to be believed then the MRA should explain why it is using the peoples money to pay the huge costs of hiring Allens Arthur Robinson to defeat a claim by indigenous landowners who say they have not been consulted on the Ramu nickel mine’s submarine tailings disposal plans which will see 100 tons of mine waste dumped in their seas; have not agreed to the dumping; and do not believe it will not have a negative impact on their environment. Who is the PNG government trying to protect here? The indigenous people of PNG or the Chinese State owned company that is developing the Ramu mine? And if the landowners case has no merit as the mining companies claim why is it necessary to waste money PNG tax payers money on an Australian law firm? Are the MRA and the Somare government just the puppets of the Chinese State? Tiffany Nonggorr, lawyer for the indigenous landowners who have obtained an injunction against construction of the submarine tailings disposal system for the Chinese State owned Ramu nickel mine, has gone to the media to protest about claims made by Highlands Pacific that ‘legally recognised landowners support the Ramu nickel mine’. Nonggorr says these claims by Highlands Pacific, who own a minority stake in the mine, are “false” and “misleading”. “These statements are misleading as there are no legally recognised landowners over any of the mine impact area, only disputing claimants to the land. For Highlands Pacific, or anyone else to claim that there are, is a lie,” says the lawyer. “The truth is that there are 360 landowner clans/groups involved in 60 registered land disputes with the Land Titles Commission over the areas covered by the mining tenement. The disputes started in the Local land Court in 1999, but as there were so many disputes the Government in 2001 suspended the Local Land Court and said it would put in a special land titles commissioner to determine the disputes. However, no SLTC were appointed until 2004 and even then only one was appointed. The commissioner called for everyone to file their disputes and supporting material and the 360 parties involved in the 60 separate disputes were registered with the Land Titles Commission in Madang. As one dispute normally takes months to hear and determine the Special Land Titles Commissioner had a huge job and in fact the size of the task demanded that at least ten commissioners be appointed if the government were serious about resolving the disputes so the genuine landowners could be involved in the development and use of their land. All the landowner clans have the same legal status are “disputing claimants” and have the right to be heard and consulted on issues surrounding the mine.” says Ms Nonggorr. Papua New Guinea’s Attorney-General and Justice Minister, Dr Allan Marat, has questioned the truthfulness of scientific advice to the Government on the safety of the dumping of mine tailings in the ocean. Dr Marat is calling on the Government to engage an independent team of scientists or experts in deep sea mining disposal to do research on the issue and establish whether the mining companies are correct that the tailings do not damage the marine environment and marine life. The PNG government currently allows submarine tailings disposal at the Lihir gold mine, has approved the marine dumping of 100 million tons of mine waste from the controversial Ramu nickel mine and is allowing Nautilus Minierals to do develop the world’s first underwater mine in the Bismarck Sea. Dr Marat says he has not been involved at all in the development of the Solwara One undersea mining proposal despite the fact it has progressed to an advanced stage. “The developer of Solwara One, Nautilus Minerals Inc, plans to have its stockpiles in my electorate. As Rabaul MP, I have never been invited by the department of mineral policy and geo-hazards management and the Mineral Resource Authority to all the meetings and discussions relating to the undersea mining project”. On April 14, over 500 indigenous landowners from three coastal districts in Madang Province met to discuss plans by the Chinese Metallurgical Construction Company (MCC) to dump hundreds of tonnes of mine waste into their pristine seas. The meeting at Bongu village concluded with the landowners signing a petition to be presented to Madang Governor, Arnold Amet, calling on him to support the people in opposing the mine waste dumping. The video below captures some of the speakers and the angry mood of the people who do not seem about to give up their fight to preserve their local environment. Why is a mining company paying travel costs for the government regulator? The controversy over the Chinese owned Ramu nickel mine and its plans to dump hundreds of millions of tons of mine waste into the pristine waters of Basumak Bay just gets deeper and deeper. While the Chinese Metallurgical Construction Company is still reeling from its failure to persuade the National Court to lift an injunction preventing the construction of its submarine tailings dumping system, new evidence has emerged that the mining company has paid the travel costs for the lawyer representing the government department that is meant to be regulating its activities, Laias Paul Kandi, and one of its staff. The Department of Conservation (DEC) has as its a mission to ensure natural and physical resources are managed to sustain environmental quality and human well-being. Two of DECs primary functions are “environmental impact assessment of major projects including mining and proposals and pollution control”. DEC is required to monitor, assess and manage all development proposals through the environmental planning legislation. Once approval has been granted and the development proceeds, DEC is then responsible for ensuring that the development’s progress complies with the conditions laid down in the environmental plan. This involves regular inspections and the evaluation of monitoring and survey results to verify compliance. But how can DEC even pretend to be an independent and effective regulator of the environmental impacts of major resource projects when it allows a foreign mining company to pay for the airfares, accommodation and meals for its lawyer and one of its officers? But this is exactly what has been happening in the case of the Ramu nickel mine injunctions. And to make matters worse, after a recent hearing in Kimbe, MCC representatives were apparently furious because the DEC lawyer had not said things in court that Wari Iamo, the Secretary for DEC, had told MCC the lawyer would say? What is Wari Iamo, boss of DEC, doing telling a Chinese mining company what DEC lawyers will say and do in Court? This it seems exposes as a complete sham the government’s supposed role as a regulator of the mining industry and protector of the rights and interests of the people of PNG.